Nothing can revive a DOA PowerPoint presentation faster than animations. Applied judiciously, these motion effects can bring dynamism to your deck and make your message more powerful. 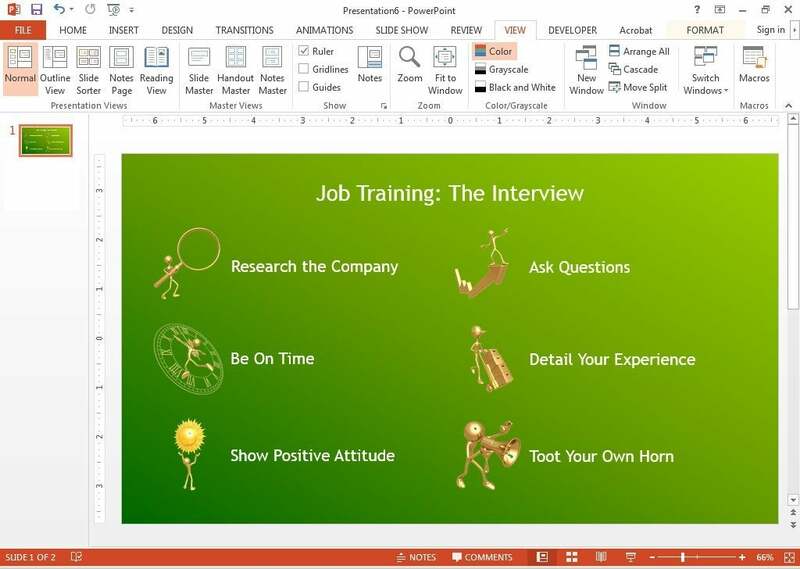 Using the entrance and exit animations in PowerPoint 2013, text and other objects can drop, flip, or fly onto or off of your slide. You can make them pulse, spin or shimmer for emphasis. You can even set motion paths to make them slide, hop, and boomerang across the screen. 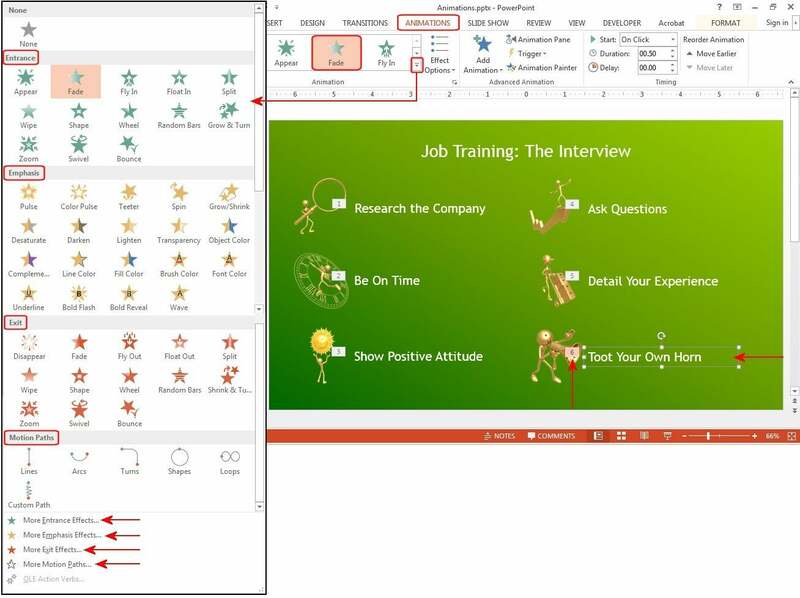 Start by creating a new slide or choosing one from an existing presentation. 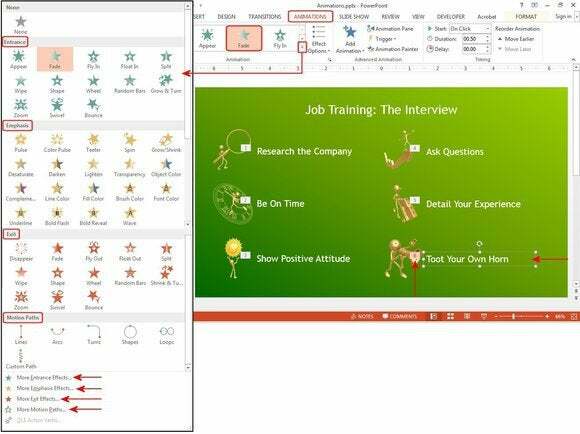 Look for slides that imply movement, change or progression—menus, maps, and charts are prime candidates—and keep it to about one-third of the total number of slides so it doesn't get distractingly busy. Start by creating or opening an existing static slide. Next, select an object on the slide and click the Animations tab. Choose an animation from the icons displayed. Effects are color-coded by type—green for Entrance animations, yellow for Emphasis, red for Exit, and blue for Motion Paths. When you select an animation effect, PowerPoint immediately previews it so you can see what it does. If you don't like it, click the object again, select a different effect, and it's replaced. Add some animations to the objects on the slide. Note that additional animation options are available on the submenus at the bottom of the Animations list. You can access additional Entrance and Emphasis effects at the bottom of the animations list. Before you add any more effects, it's a good idea to rename all the objects on your slides. You’ll quickly lose track of which text box is the title and which graphic is the clock if you try to rely on the generic default names. 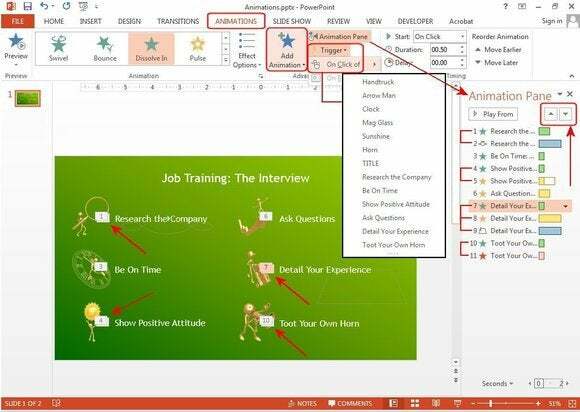 To do this, select an object , then click the Format tab (note: the Format tab is visible only when an object on the screen is selected). 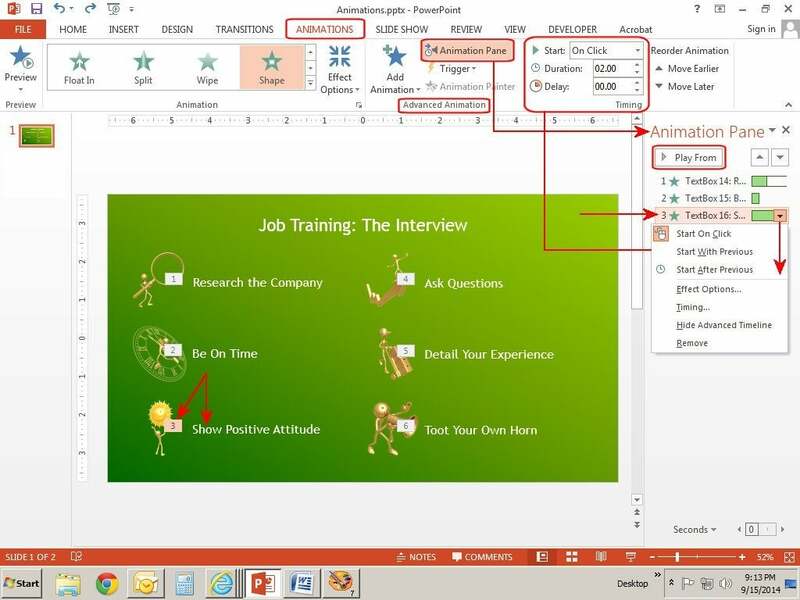 Next, select Arrange > Selection Pane, and the Selection window opens with a list of all your animations. Double-click each one and give it an easily identifiable, descriptive name. When finished, close the window. 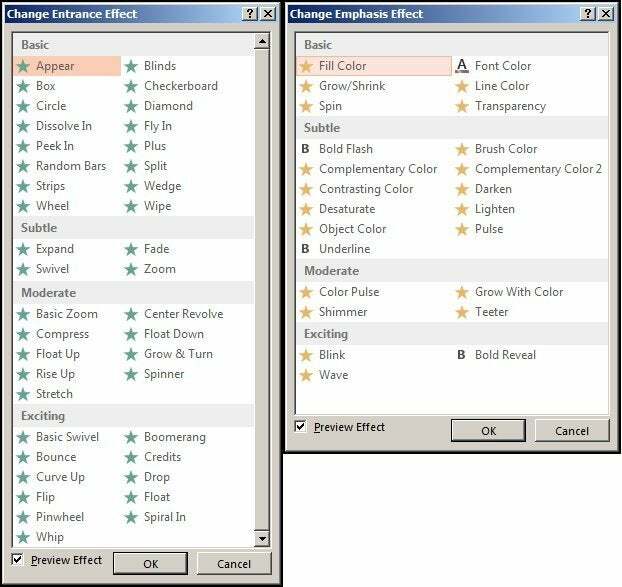 Now, if you add more effects to any of the current objects, PowerPoint will use these names. Change default generic object names to something more descriptive to avoid confusion. Objects are not limited to one animation effect. You can combine animations to make a slide element really stand out. For instance, you could make the six menu items in our example presentation fade in one at a time, then add a second effect that makes all of them shimmer simultaneously once the full menu is displayed. To combine effects, select an object that has already been animated. Select Animations > Advanced Animation > Animation Pane > Add Animation, and pick another animation from the list. Repeat this process for each animation you want to add to that object. You can see in the image below that "Research the Company" has Dissolve In for the Entrance animation and Loop de Loop from the Motion Path list for the second effect. "Be On Time" only has one animation—Fly In—on entrance. "Show Positive Attitude" Fades In on entrance with a Shimmer for emphasis. "Ask Questions" only has one Emphasis effect, Teeter. "Detail Your Experience," has three effects: It Bounces on entrance, Spins for emphasis, then does a Trapezoid dance on exit. And the last item on the menu, "Toot Your Own Horn," Fades In on entrance and then Fades Out on exit. The Animation Pane makes it easy to combine effects and change the playing order of the animations. The screen displays each object with animations in numbered, gray boxes, with multiple boxes denoting multiple animations. Pink boxes indicate the currently selected object. The list in the Animations Pane shows the order of play. Use the up and down arrows at the top right of pane to rearrange the play order. You can customize the timing and duration of each animation you use. 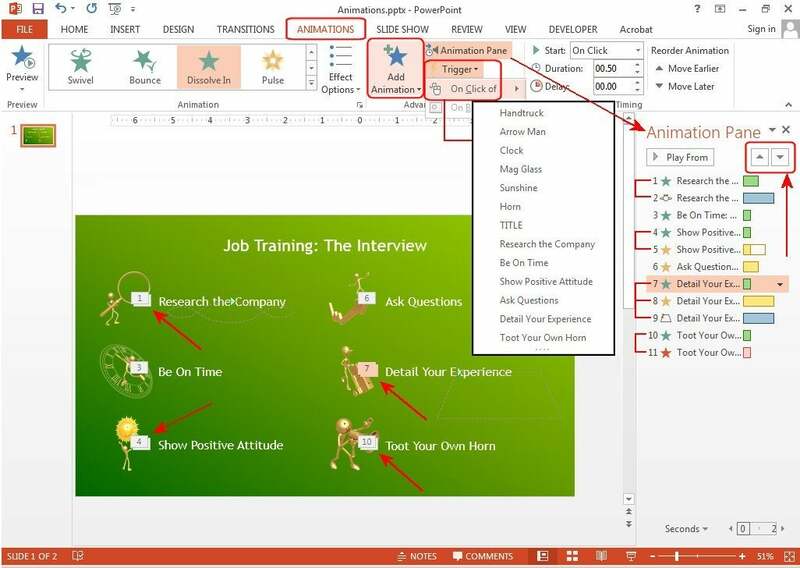 Select an object on the slide and select Animations > Advanced Animation > Animation Pane. Here, you can customize the animation's performance from the Timing group, or click the arrow beside the selected animation (highlighted in pink) and define the performance actions in the drop-down list. 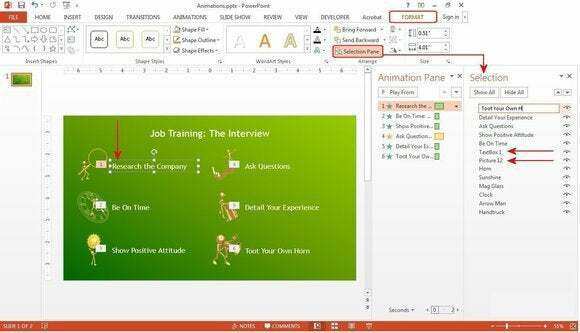 Set the start time, Timed animations work better for demos and sales presentations that run continuously at trade shows and sales conferences. You can view the animation as you work by clicking the Play From button. You can set the start, duration, and delay times for each animation effect. Once you’ve got the hang of how animations can work for you, you’re limited only by your imagination. Explore PowerPoint's multitude of animation options and make your presentations unforgettable.